I would like to share with you why WALMART is my favorite store. 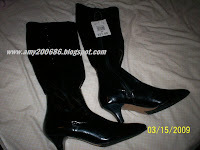 This is a Manhattan boots worth $27.00 and since it is the last pair and fits my shoe size, i bought this in an unbelievable price of $3.00. I bought another one but, I will show it next time. My shoe size is 5-6, so, what a super sale right?